Keen to get out and score some more SOTA points my daughter and I headed for South Hells Gate. We left home at 6:15 am and, according to my Internet survey the hike up would take about 90 minutes. All going to plan we would start hiking about 7:40 am and be on the summit about 9:10 am and on air at 9:30 am. I had posted an alert on SOTAwatch for 9:30 am and also advised the VK SOTA Yahoo group that I would be on air from 9:30 to 10:30 am enabling chasers to get double points by working the hill in different UTC days. My estimate of travel time was wrong and where we would start from was also wrong. We were able to park much closer to the summit than I had planned. We also got there much quicker. So we parked the car at 7:20 am and were on the summit at 7:50 am. 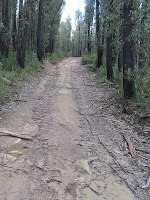 The way to the summit was mostly on a good condition track, suited to four wheel drive vehicles. The last 600 metres was steep, rutted and, while not impossible in a four wheel drive, would challenge most drivers and vehicles. The SOTA summit is on Robertson Creek Fireline and the land managers have gone to some effort to close a short-cut track between Robertson Creek Fireline and South Hells Gate Track. The short-cut takes about 250 metres off the distance and goes along the flat whereas the roads drop down 30 metres and rise back up the same. It also bypasses a gate closing the track to vehicles. To stop cars and motorbikes using the track the land managers have dug many holes with an excavator about 1 m X 1m and about 1/2 metre deep. These holes are randomly placed along the length of the short-cut. In the middle of the short-cut they have also placed some big boulders. On foot, with care, we were able to negotiate a path through but over time I expect that the path will become overgrown and impassable, even on foot. 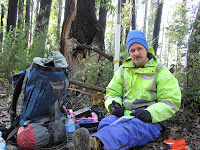 Once on the summit I sent an SMS to Glenn VK3YY telling him I was on site early and would be on air soon. 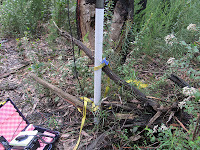 I got the antenna up quickly and was on air just after 8:00 am with my first QSO at 8:11 am. The weather forecast for the day was for scattered showers, possible hail and thunder, snow showers above 500 m. Now, sitting on a hill about 600 m above sea level with a forecast like that made me want to get the required four QSOs in the log and get out as soon as I could. I made five QSOs on 40 m, only one was a SOTA chaser, and packed up and headed back to the car at 8:50. I got a reply SMS from Glenn at 9:15 am saying he was tuning around and the frequencies were clear. By 9:30 am, when I was scheduled to be on air, we were driving away in the car. I have marked up a map showing where we parked and where I think four wheel drive vehicles would be able to park. At present some of the tracks in the park, including part of South Hells Gate Track, are closed to vehicles until the end of October. 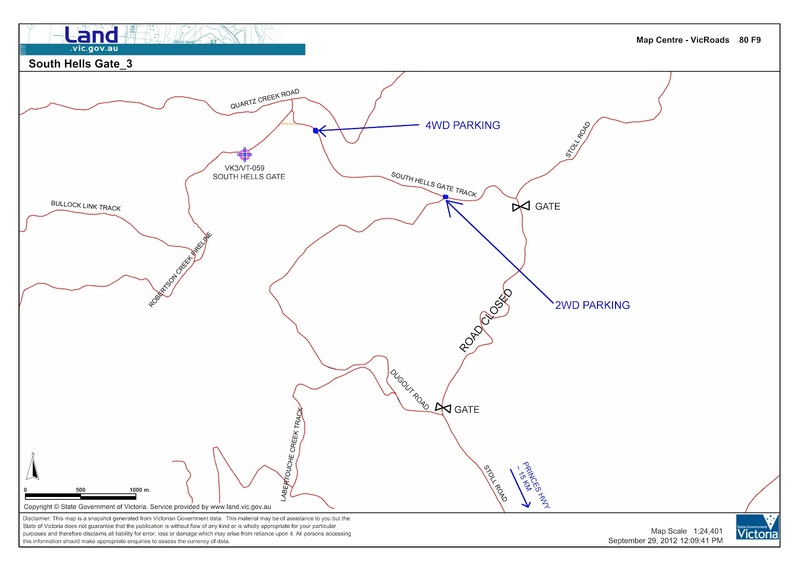 Stoll Rd is permanently closed between Dugout Road and South Hells Gate Track as it is now private property. There is a sign on the gate showing the way around. My next SOTA in this area will be North Hells Gate. I’ll wait until November for that so I can drive a little further up Proposch Road which is currently closed.